Net-Metering allows a renewable energy plant owner to export excess renewable energy to the utility grid and benefit from a likewise deduction from the customer's electricity import/consumption bill. The net-meter tracks both energy consumed from the utility grid and the energy exported by the renewable energy system and allows the utility to bill the customer based on the 'net' electricity consumed during the billing period set by EDL. The industrial facility, Gemayel Freres (GF), has recently installed a 3-phase net meter. 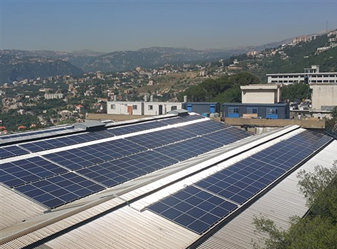 GF has a 300 kWp solar PV capacity, generating 428 MWh a year, and saving Lebanon 300 kg of CO2/annum. Solar photovoltaic projects are now becoming one the cheapest ways to generate power. From 2010 to 2017, the turnkey cost of installing a commercial solar power system in Lebanon has fallen from approximately $3500 to less than $1000 per kW. What are you waiting for? Lebanon: Annual PV capacity growth rate increased from 37% to 123% between 2010 and 2016. As per the National Renewable Energy Action Plan (NREAP), Lebanon’s solar PV distributed generation target was set at 100 MWp by 2020. Given the market’s growth rate to date, reaching the 100 MWp target looks to be within reach! What are the eligibility criteria to apply? An applicant that wishes to connect an on-site renewable energy system, with the main purposes of satisfying his/her local demand for electricity, and wishing to export any excess to the grid, is eligible to be included in a net metering scheme, subject to the required technical standards, and safety requirements (please refer to the checklist in the application form to view these standards and criteria). How does a renewable energy plant owner benefit from net metering? Renewable energy sources do not always coincide with the demand for electricity in our homes and offices. With net metering, a client can export RE power when the demand is low, and reduce the imported power, when the on-site demand is high, thus maximizing the value of RE sources. Any excess energy fed to the grid by the RE plant will be deducted from the utility bill that is issued every two months. If a producer exports renewable energy more than his/her total energy consumption in any given billing period, then the excess balance is transferred and credited to the next billing period. This process happens over 1 year (January to December), where at the end of the year the meter will be reset again to zero. How to apply for a net meter? One can apply to a net meter by filling in the net metering application and uploading all the needed documentation online. A unique ID will be automatically sent to the applicant’s email address. The unique ID can be used to track the application on the net metering website. The process can take up to 3 months from the application submittal to final approval. The speed of the process is dependent on the completeness and accuracy of the application form filled and the submitted documentation requested. What is community based net-metering and how can it be implemented? A centralized renewable energy plant feeding energy into the utility grid can operate under a virtual (community-based) net-metering scheme. The energy exported by the plant will be divided and distributed among the different shareholders based on the size of their share. The billing and the net energy consumed is individually calculated for each subscriber via a web-based tool that communicates with the installed smart meters. For more information on community-level net-metering, please contact CEDRO - UNDP. The components of my system do not have all the required certificates and standards; can I still apply? It is mandatory that all the required certificates are presented for the components in order to attain an approval for a net meter installation. I submitted my application and I received an email asking for additional documentation, what should I do? Reply to the same email while attaching the needed documents.